The "Dawg" is the owner and president of a concrete products company in central Michigan. 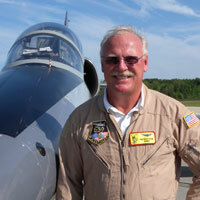 He has been flying for 38 years, 16 years in jets, and holds an ATP commercial pilots license and instrument rating. He has 6000 hours flying including 1000 hours in jets and He is also a certified instructor pilot and a qualified lead formation pilot. Tim and his wife Beth live in Battle Creek, Michigan, as do his six adult children. The Dawg has many hobbies including scuba diving, skiing, and golf. 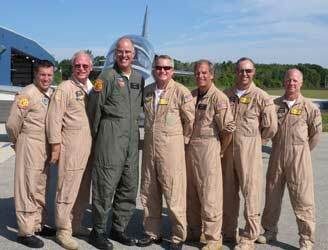 He enjoys flight instructing, as well as helping the Boy Scouts of America with their "Flying Merit Badge. Mr. Brutsche (nobody ever calls him that) also volunteers for charity flights with the group, "Wings of Mercy," transporting patients across the country. Additionally, he is a 31-year volunteer check pilot and instructor for the Civil Air Patrol (CAP) and says, "These pilots are a great bunch of folks to be around and if I crash I want them to come looking for me." The CAP pilots do the majority of the search and rescue work for the Air Force and are not paid. The Dawg has flown 50 different airplanes from Cubs to a 757 and says, "Flying with the Hoppers at 400 knots, five feet apart in a 4-ship is the greatest thing I have done." Come to think of it, the Dawg says a lot of things! Hoppy is the president and CEO of Hopper Flight Mascot Services, Inc. He has been flying since childhood and has more flight hours than all the Hoppers combined. Most of his experience is low level aerobatics. Hoppy was orphaned in Moline, IL where he met Grasshopper right around the time the Hoppers were forming the team. He was adopted by the Wood family and makes his home with them in Waukegan, IL. Hoppy rides shotgun with "GH" on every flight and has accumulated over 500 hours in jets. He has flourished in his new role and comments, "I love flying with the Hoppers!" Regarding the jets, he loves the smooth ride and says "sometimes GH gives me a few extra Gs and it's great!" "Puck" is a pilot for United Airlines based in Chicago, IL. 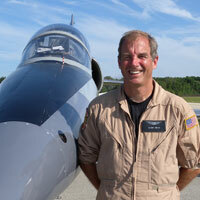 He has been flying for 25 years and has over 10,000 hours flying including 9600 in jets. He was a pilot in the USAF with 1200 hours in the F-15C Eagle. Puck now spends his spare time as an instructor and flight examiner in the L-39 and has 670 hours in the Albatross. Steve and his wife Christine live with their three daughters in Moline, IL. Puck started with the Hoppers early on as a formation instructor and comments, "I have been impressed with the dedication the Hoppers have demonstrated to improve both individually and as a team. They are a great bunch of aviators and friends." "Mildred" is the owner of Mills Chevrolet. He has been flying for 27 years and holds a commercial pilots license and instrument rating. He has 3000 flight hours including 750 in jets. He is a qualified lead formation pilot. Dave and his wife Gretchen live in Moline, Illinois with their three children. Mildred traded in his T-28 for the L-39 which he currently flies along with his Socata TBM 700 passenger plane. On flying highlights he comments, "Formation and aerobatic training was my breakthrough." 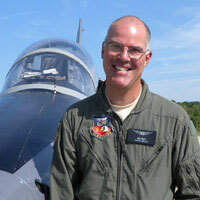 Flying with Puck (Steve Kirik), a former USAF F-15 pilot strengthened my skills and took me to the next level." Mildred is never at a loss for words!! and says, "Flying is my passion. I hate golf, but I love to fish, ski, dive, fly and spend time with my family." "Hack" is an entrepreneur in the medical device industry and has been the founder, board member or key person at a dozen companies including SCIMED Life Systems which is now a major part of Boston Scientific. He has been flying for over 35 years, with more than 20 years in jets, and holds a commercial pilots license and instrument rating. Dan has over 3000 hours flying including more than 1000 hours in jets. He is rated in the MiG-17, MiG-15, L-39, L-29, multi-engine land, single engine land, and tail wheel aircraft. He is a qualified lead formation pilot. Dan lives in Minneapolis, Minnesota. Hack currently flies a MiG-17, L-39, L-29, Piper Seneca and a Super Cub that has been modified for Alaskan bush flying. 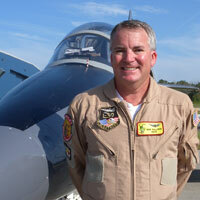 He is passionate about using the jets to make young kids think ahead. His message to kids is "Do well in school, think BIG and then work really hard. You can do anything!" He describes the watershed events in his flying career as getting comfortable flying on instruments, getting comfortable with a tail wheel and becoming comfortable upside down and in the vertical during aerobatics and formation. FA-18 Hornet flight - A few years ago he had the opportunity to land his L-39 on a U.S. Navy base and give two days of familiarization flights to Navy instructor pilots so they could learn the enemy trainer. Hack was also fortunate to receive training from naval experts in ejection, water survival and high altitude which were followed by a flight in our country's premier fighter, the FA-18 Hornet, where they allowed him to take over and put the airplane through its paces! "The flight of a lifetime." He recently flew the bush plane from Alaska through the wilderness, across Canada, through the United States and deep into Mexico. "Down low at 90 knots, you really get to see the country!" Last, but not least, the Hoppers, "The Hoppers are my second family, I have a contract with these guys. I trust my life to them, they trust their life to me. It's a bond so deep, you can't break it, and you can't describe it." "Grasshopper" is a retired co-founder and managing director of Madison Dearborn Partners, one of the largest leveraged buyout firms in the country. He has been flying for 16 years, 9 of those in jets, and holds an airline transport pilot license (ATP) and instrument rating. Paul has 4000 hours flying including 1500 hours in jets. He is rated in the L-39, T-28, T-2, F-86, AD-1, multi-engine land, single engine land and tail wheel. He is a qualified formation lead . Paul and his wife Corrine live in Lake Forest (Chicago), Illinois with their three children. Their family is no stranger to achievement as Corrine is the former Lt. Governor of Illinois. "GH" is in the deepest airplane pit of all the Hoppers! He is currently flying a Stearman N25-7, L-19 Birddog, T-6, T-28B, L-39, F-86, A-1 Skyraider, A-4 Skyhawk, P-51, Aviat Husky, Citation CJ-1, and T-2 Buckeye (one of only a few Navy trainers flying). Grasshopper started flying in high school and then put it on hold while he developed his business. Now that he is retired, he is able to fly on a regular basis. 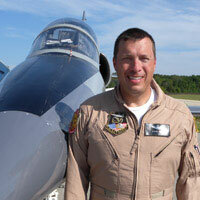 He is an accomplished pilot and is a regular on the vintage warbird airshow circuit. Among his many flying highlights he lists the Navy Legacy Flight program, flying with the Hoppers, and a 2004 flight around the United States in his Husky Tailwheel, where he spent over a month flying the perimeter of the United States accumulating 110 hours and 13 minutes. This flight was sponsored for the purpose of raising money for underprivileged children. Paul's dad, a non-flyer, was able to accompany him for the majority of the trip where they camped, stayed at small airports and met a variety of interesting people. His dad Bob commented, "You never know what that kid's going to do next!" Grasshopper is quoted as saying, "It's great to fly with a group of men who are great pilots, but also great friends." We lost our team mate and close friend Glenn Smith, call sign "Skids", to an accident at the Quad City Air Show on September 1, 2012. Glenn recently retired after building a very successful business in the software industry. He had many interests and loved to be out in nature, as well as traveling the world. "Skids" was a careful and very accomplished pilot and was rated in a variety of airplanes. He always went out of his way to achieve the Hopper Mission. He leaves behind family and many close personal friends and associates, as well as his Hopper Team. We thank the people that have written with your thoughts and prayers, it helps. He left us too early and we will miss him. "We don't do this with just anyone. Training, discipline, critique and striving for perfection allow one brief moment of time in the zone," said Hack. The seeds were sown for the Hoppers many years ago. Mildred and the Dawg were flying T-28s together in the 90s. 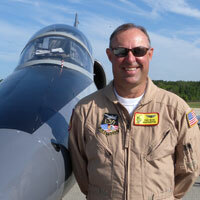 Hack purchased his first military jet in 1995 and the L-39 in 1997. Grasshopper was in the T-28 and other warbirds in the 90s. Skids was in a twin engine prop. 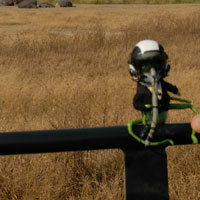 In 1999 Mildred, the Dawg and Hack all showed up at a formation clinic and the catalyst was in motion. They flew together in formation and combat maneuvering. Mildred followed up connecting the three pilots. Mildred's association with Puck connected Paul Wood to the group. During a fly in to Moline, Paul met Hoppy, happily assumed the new handle of Grasshopper and the team was born! Skids appeared during the summer of 2005. Puck comments, "I met Mildred in 1997 when he was looking for an L-39 and Tim Brutsche in 1998 at Oshkosh where we flew formation for the first time. I checked Paul Wood out in the L-39 in 1999 and taught him initial formation in the L-39. I met Dan Sullivan in 2001 at a formation flying event and Glenn Smith in 2003, and began formation flight training with them in the L-39." Mildred sums it up when he says, "I consider my Hopper flight team pilots among my closest and trusted friends. We not only enjoy our friendship, but we trust each other with our lives. It is a great group of pilots and we have fun everywhere we go."